Few foods are considered more quintessentially American than a juicy hot dog, fresh off the grill. However, did you know that the backyard barbecue staple is actually European? While it’s impossible to say who really “invented” the popular snack or where it came from, experts say hot dogs likely originated in Vienna, Austria, or Frankfurt, Germany. If this trivia bit blew your mind, here are seven other fascinating facts about the tasty barbecue staple. 1. THE HOT DOG’S TRUE ORIGINS ARE A MYSTERY. Essentially, hot dogs are a modern-day twist on the humble sausage—a food that has some seriously ancient roots. Sausages were mentioned in Homer’s The Odyssey, and Emperor Nero’s chef, Gaius, is said to have prepared them for his ruler. Centuries later, someone got the idea to put the meaty treats on buns—but who? To this day, several conflicting claims exist. According to the Austrian city of Vienna, two Austro-Hungarian immigrants, Emil Reichel and Sam Ladany, invented the hot dog in their fair town. When the two men left Europe for Chicago, they took the recipe with them, and sold hot dogs at the 1893 World’s Fair. Later, Reichel and Ladany founded a famous beef production company that’s still churning out hot dogs today. Meanwhile, officials in Frankfurt, Germany, say that hot dogs were invented in their city in 1487. And according to a third tale, a butcher named Johann Georghehner, who lived in Coburg, Germany, invented the hot dog during the late 1600s, and traveled to Frankfurt to promote his new food. 2. THERE’S A “RIGHT”—AND A “WRONG”—WAY TO EAT HOT DOGS. Enjoy dousing your hot dog with ketchup, or eating it with a knife and a fork? You philistine. According to one American meat trade association’s official etiquette guide for hot dog-eating (yes, this actually exists), it’s tacky to top your frank with the red sauce if you’re over 18 years old, and pretentious to consume it with utensils. Other no-nos? Placing the dog on a fancy bun, like sun-dried tomato or basil, and serving it on anything fancier than a paper plate or everyday dishes. A few “dos”? Eat every part of the hot dog (including leftover bun bits), pair it with simple drinks and sides, and always lick off any condiments that you find on your fingers. 3. MUSTARD IS THE MOST POPULAR HOT DOG TOPPING (BUT KETCHUP COMES IN A CLOSE SECOND). Even though it’s supposedly gauche for adults to eat ketchup on a hot dog, the verboten condiment is still a popular topping. According to one 2014 survey, 71 percent of Americans said they liked to garnish their hot dogs with mustard. However, an overwhelming 52 percent of respondents said they preferred to smother their dogs with the flavorful tomato sauce. 4. HOT DOGS HAVE BEEN SENT TO SPACE. Believe it or not, astronauts on the Apollo 7 mission in 1968 didn’t really like the freeze-dried ice cream they were to be served in space. The food was removed from the space program, and it eventually found a home in museum gift shops. However, one classic meal item that later crewmembers—including those on the Apollo 11 mission—actually enjoyed was hot dogs. 5. 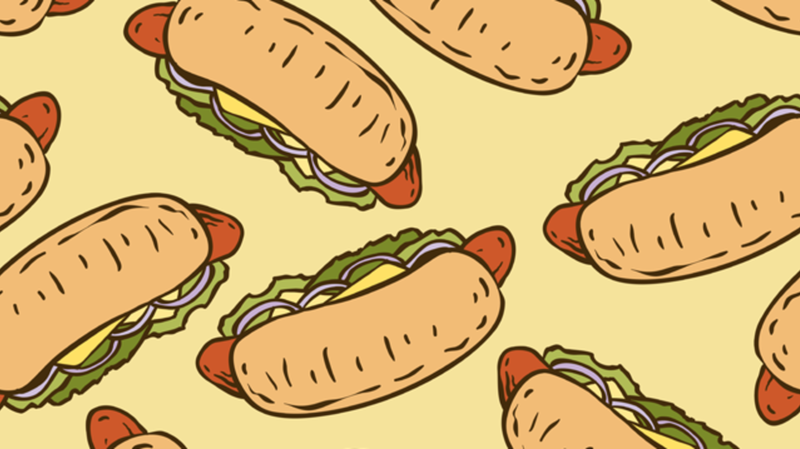 AMERICANS EAT (AND BUY) A LOT OF HOT DOGS. On July 4th, Americans will enjoy 150 million hot dogs. Between Memorial Day and Labor Day, Americans will eat a staggering 7 billion hot dogs. And in 2015, U.S. supermarket customers spent more than $2.5 billion on hot dogs alone. 6. A HOT DOG ONCE SOLD FOR $169. In 2014, the world’s most expensive hot dog sold in Seattle, Washington, for $169. The cheese bratwurst was smothered in butter Teriyaki grilled onions, Maitake mushrooms, wagyu beef, foie gras, shaved black truffles, caviar, and Japanese mayonnaise on a brioche bun. 7. A COMPETITIVE EATER CONSUMED 62 HOT DOGS IN 10 MINUTES. You may think you like hot dogs—but do you like them enough to swallow more than five dozen in one sitting? In 2015, one competitive eater broke the record for hot dog eating when he gulped down 62 hot dogs in 10 minutes.